Folding patio doors allow the inside and outside to merge. Add elegance and versatility to your home with patio folding door systems. 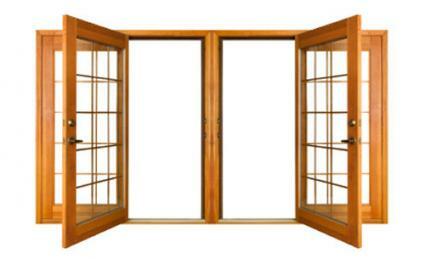 What Are Patio Folding Door Systems? When faced with the option of sliding doors or French doors, many homeowners are vying instead for the distinct advantages of patio folding door systems. A bank of doors is hinged together equipped with wheels along an overhead track, which is secured into the lintel, or framing. Guides roll the door panels along the bottom track. Each door is hinged, allowing the entire unit to open accordion-style and fold together into a single panel at the end of the row. Some regular exterior door models only look appropriate with certain architecture. However, patio folding doors are extremely versatile. Companies manufacture these types of doors in many materials, including wood, aluminum, fiberglass, and sometimes steel, each offering individual benefits relating to use, durability, and maintenance. The glass in the doors may be etched or otherwise decorative, have divided wooden slats installed for a traditional or Prairie home look, or remain smooth for a clean, contemporary look. Maximize the use of indoor/outdoor space. Allow for combinations of access, from daily activity through one door, to full party mode with an entire wall open. Update the home with an outdoor room effect. The doors come in a variety of finishes and design options. Most are built to code to withstand hurricane conditions. Somewhat cost-prohibitive as a general improvement project, as they cost about twice the amount of other exterior patio door systems. Difficult to retrofit certain styles of homes without considerable reconstruction. Not exactly a weekender project, as installation requires the expertise of door and window professionals. Although every door and window needs to be set plumb within the frame, patio folding door systems have additional issues to keep in mind. Proper weather sealing is important, but there are different track systems for different purposes, so make sure you have the track system that best suits your purposes. Switching out old aluminum sliders for folding doors is not just a replacement job. The header of the frame must be strong enough to support a top-hung system and if it isn't, may have to be reinforced or replaced altogether. Additionally, many older homes tend to shift over the years, but the opening must be exactly square for the folding system to slide properly. While some folding systems are prefabricated, prepare for the additional time and cost to have a European-style system installed, as it requires custom millwork. Folding doors systems have been very popular in Europe and Australia for a number of years, but were only recently introduced to the United States. Fortunately, there are already a number of dealers and manufacturers offering various styles. Many of the websites have incredible pictures that demonstrate how attractive the patio folding door system is and its multiple uses. JELD-WEN: This international company was just a small millwork operation in 1960. Today, it is a leader in door and window solutions, as well as garage doors. NanaWall: This company was a pioneer of the "glass wall" look that's very common in beach front and mountain homes. The site offers access to trained installers. Solar Innovations: This company first specialized in greenhouses and sunrooms, and continues to provide indoor/outdoor door solutions.